What does it really take to make a home accessible?. 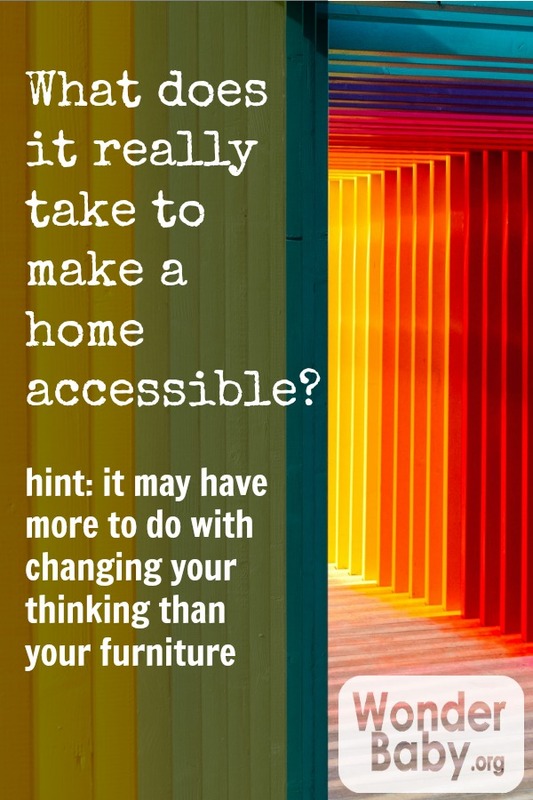 hint: it may have more to do with changing your thinking than your furniture. This is what I hear in my head. These were some of the truths I grew up learning and accepting and never questioned because it is just what you did. When we bought our first home, a beautiful 1910 Colonial with original wood, we did not paint it. Years later I asked my Nanna if I could have her Ethan Allen trestle table, after she happily gave it to me – cause it was only sitting in her basement and used whenever she made homemade ravioli – I immediately started scouring the internet looking for the matching hutch. AND I FOUND IT FOR $250!!! Mission accomplished. The legacy of stained wood and hutch ownership successfully passed on. But sometimes traditions need to change. We recently started the exciting process of modifying our home to make it accessible for our daughter Shelby. 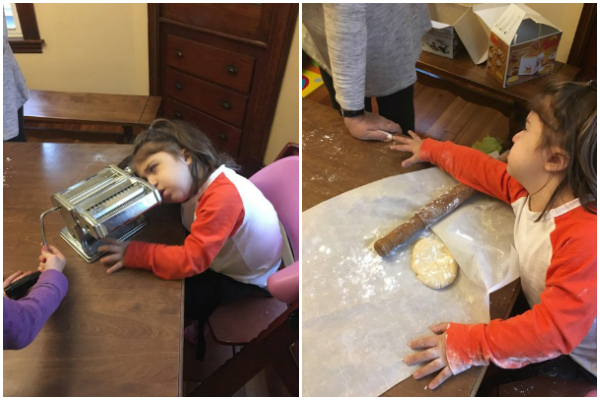 In addition to being one of the cutest human beings on the planet, Shelby is medically complex, developmentally delayed, deafblind, and has CHARGE syndrome. As part of this project we hired a universal designer to help plan a home where all Shelby’s needs are considered; this team is going to take care of the functional and the aesthetic aspects of the remodel. I eagerly awaited the day when our designers showed us their ideas and explained why certain things would be necessary for Shelby. They showed us faucets with lever handles and not knob handles, because levers are easier for someone with limited mobility to use. I saw that and was on board! Great! Totally makes sense! They went room-by-room and concept-by-concept. Then they pitched something very controversial… paint your wood. They showed me beautifully decorated rooms with, in my opinion, tastefully and colorfully painted doorways and stairs. I did a full body cringe. Their explanation was that “in an effort to make it easier for Shelby to navigate around the home you could potentially paint each door frame a different color so she knows ‘when I go through the orange door I am going from the kitchen to the bathroom’ etc.” This modification made total sense, it is actually similar to what her school does, and fit my love of funkiness in design. I told them I loved the colors and aesthetic. It matched our family’s feel and my personality. BUT I can’t do that because you don’t paint wood. How could I do that? You don’t paint wood. An aside: I don’t want the all white kitchen, I don’t like that Magnolia style. It looks nice but BORING. I love classic, color, eclectic, and quirky but I have never been able to mesh those things together in our home, I have played it safe. 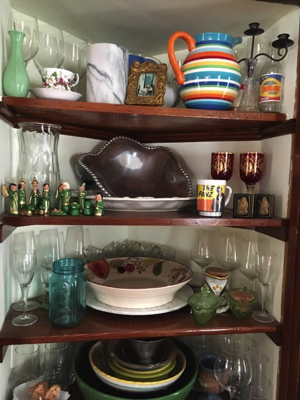 Here is my built-in cabinet (not my Ethan Allen china cabinet) displaying a good example of my style in the second row down – Mexican creche, Mariposa bowl, Fonz mug, Venetian wine glasses, praying hands salt and pepper shakers. A few weeks have passed since that pitch meeting and I’ve had a lot of conversations with myself around painting wood: “this is going to help Shelby”, “you love this and how funky it is, this is your style”, “it is ok to do something contrary to what you grew up with.” I have come to the decision I am painting my wood! I also decided to ditch my china cabinet, by keeping it I am holding on to something that will continue to make it difficult for Shelby to navigate the house in her gait trainer. Why am I sharing this? I guess it is a little New Year resolution-y, which I don’t do, but for me it was refreshing and enjoyable to think about challenging old thinking. It is exciting to think about growing and stretching myself like this. I heard how silly my objections were, how they were stuck in the past, how they were attached to a time and a person who does not exist anymore, how they were for a family with needs that don’t match ours and I realized it was time to change. PS Once our project is complete I plan on sharing what we did. I am so excited to fill you all in!